Jojo part 3 just started and episode 2, Jojo’s mother was humming “Aoi-sangoshou” or “青い珊瑚礁 (blue coral reef)” by the pioneer of kawaii idol, Matsuda Seiko. Man, when I heard that, I really felt it was 80s. 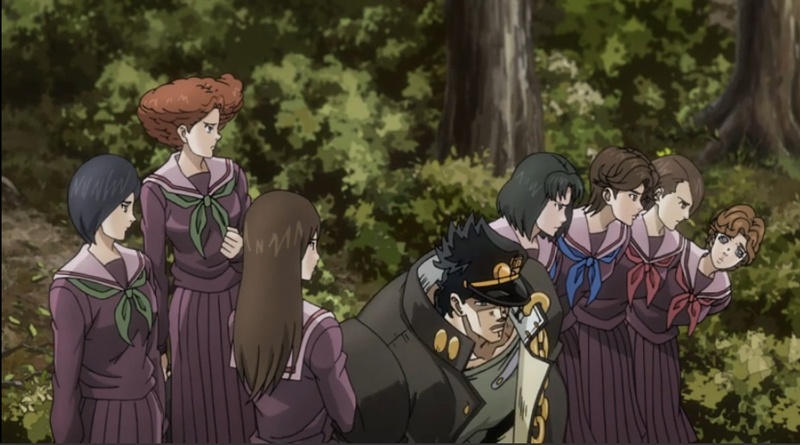 Yes, Jojo was in fact the 80s manga, but it is animated in 2013 and 2014. Oh, yes, with current technology and seiyuu, it is very masterpiece. “Ah~, watashi no koi wa~” man, that was really old song, but still, all Japanese know this song. Yes, Macross Lin Minmei, the idol saves the world, that trend, kawaii idol trend was started by Matsuda Seiko. Indeed, her hairstyle became trendy in the early 80s. Yes, and Lyn Minmei has the same hairstyle too! This particular hairstyle was called “Seiko-chan cut.” Oh yes, the period of Jojo part 3 is totally set in 80s Japan, so yes, Matsuda Seiko song totally felt that zeitgeist. Even today, there is still a lot of oyaji (middle aged men) who are still adamant Seiko-chan fans. Even at the recent Quincy Jones concert at Hollywood Ball like three years ago, when Matsuda Seiko appeared on the stage, there were Japanese oyaji screaming “Seiko-chan~!” Yes, to them, she is “eternal idol.” Yeah, even though Matsuda Seiko got older and already in her 50s now, there are still loyal fans from her youth. Probably these Japanese oyaji spent youth listening to Seiko-chan back in the 80s. So, it was very era-conscious. It wasn’t nostalgic to me though. I don’t know any of her stuff, but that song is too famous to miss. Yes, it’s like Beatles songs, people heard it somewhere at least once in their lives. Same with me, I never heard or bought CD of Seiko-chan, but I know her songs, whether I like it or not. Yes, brainwashing marketing strategy works by capitalism, like Shiba-inuko-san. Yes, first kawaii idol, probably idol boom was started by Minami Saori with “17 years old,” but kawaii idol boom was by Matsuda Seiko. And that also influenced Macross too, the prototype of Lyn Minmei. So, yes, very zeitgeist. Totally high school girls uniform are very 80s, sailor uniform with very long skirts. Skirt got short when Sailor Moon appeared in the 90s. Yes, during 80s, girls were wearing long skirts. That was the trend, especially sukeban. That’s totally zeitgeist too. Just like I felt very nostalgic or natsukashii sensation when I heard “White Snow” by SPEED in some episode of White Album 2, Ogiso Setsuna was singing that song. Yes, music is art, art representing zeitgeist, and putting anime together. Oh yes. And Soredemo Sekai wa Utsukushii, kind of Macross anime, female singer saves the world sh@t by Kawamori Shouji stuff, these old maids were referring to Candies. That was too old joke reference, 70s girl idol group. Only people from 70s understand that joke. I know Candies, but I didn’t grew up with them, more older generation, so I didn’t feel connection to it when I heard that joke. But anyway, yes, periodic anime is really great! Previous PostPunipuni upper arms, heavenly skinship ever!Next PostOne week stand! One week skinship!